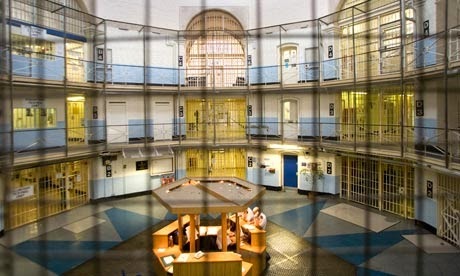 I went to prison while visiting London last year. Before that statement gives my parents heart failure, I must note that I went to prison as a visitor, not as an inmate. It was an enlightening and disturbing experience. A few months prior to my visit, I had contacted Prison Officer Stewart McLaughlin who also serves as the curator of the Wandsworth Prison Museum. Stewart was very helpful and quite happily arranged for me to visit the prison and see the cell in which Josef was kept from July 24, 1941 until the morning of his execution on August 15, 1941. Getting into prison, even as a visitor, was no small feat. I had to divest myself of: money, cell phone, camera, memory cards, knapsack and identification. I was given a "visitor" tag to wear around my neck and Stewart escorted me out of the Administration block and into the prison yard. 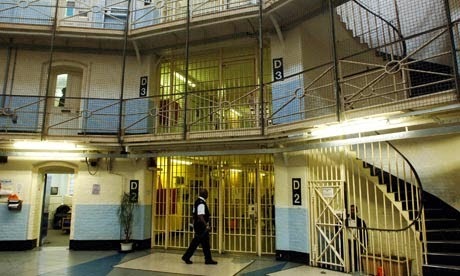 Alas, having no camera, I was unable to take any photographs inside the prison, but have scrounged a few from the web. 1851 Plan for Wandsworth Prison - showing Wings. 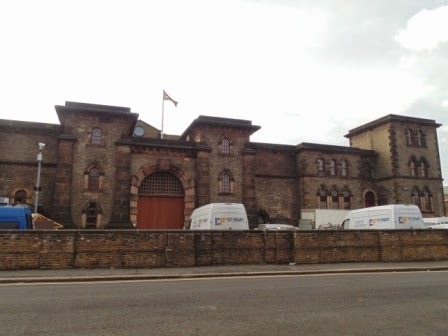 Wandsworth Prison was built in 1851 in the shape of a star with a central rotunda from which radiate five prison wings (A, B, C, D, E) and one shorter wing (F). The shorter wing, known as F wing, was the Administration wing in 1941. After entering the main gates of the prison, Josef would have entered the prison building through large doors at the end of F Wing, directly opposite the main gates. Those doors have since been walled off, so Stewart and I entered F wing through a door near the junction of A and F wing. One thing I noticed in prison was that there were a lot of doors with locks. It seemed as if there was a locked door or a locked gate every 20 feet or so. Stewart was forever locking and unlocking doors and gates. He would open the door with the key, I would pass through, then he would come through and lock the door behind us. It was a most disconcerting sensation. Finally we stood within the central rotunda. As you can see from the photograph (left), there were three floors: Level 2, Level 3 and Level 4. Level 1 was accessed through a different entrance. Within the rotunda, there were two spiral staircases that connect the different levels. One set of stairs was located between A and B wing (seen on the photograph at left), while the other was located between D and E wing (the position from which the photograph at left was taken). Back in mid-1941, two cells of Wandsworth Prison were designated as a miltary prison (Cells F2 and F3) so that Josef could be held there while he awaited his court martial and execution. - showing location of Josef's cell and execution chamber. According to the Prison Governor's diary, Josef was held in Cell F3. With a bit of sleuthing, Stewart had concluded that Cell F3 (which was on Level 3) was located at the junction between F Wing and E Wing. This cell was quite large and had bathroom facilities, something that would have been essential for a self-contained cell. Interestingly, just around the corner, in E wing, lay the execution chamber. Today, Cell F3 is the chaplain's office. 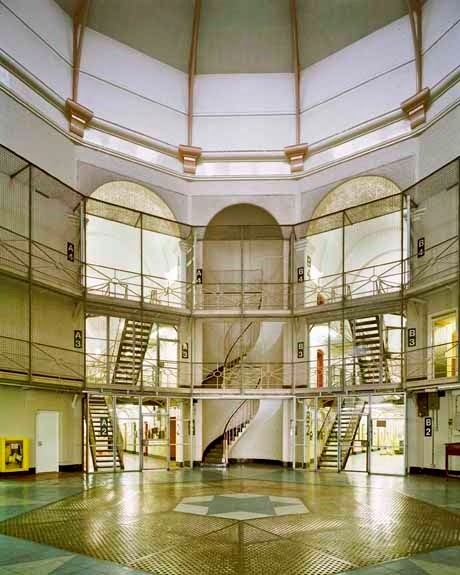 Wandsworth Prison Rotunda - showing doors of end-wing. The door to Josef's cell would have opened out onto the Rotunda. While I couldn't find photographs of the Josef's former cell, in the photograph at left, you can see a dark blue door on the main level (Level 2) located between C Wing and D Wing. There are corresponding doors located on Level 3 and Level 4. Josef's cell door would have looked similar to those. The location of Josef's cell, in close proximity to the execution chamber, would have been a cause for concern on Wednesday, August 6, 1941. It was the day after Josef's court martial. Josef had been found guilty of Treachery and condemned to death by shooting. He would have been in a fragile state of mind. That same morning, at 9:00 a.m., German spies Werner Walti and Karl Theodore Druecke were hanged in E Wing by hangman Thomas Pierrepoint, ably assisted by Albert Pierrepoint (his nephew) and Harry Kirk. Josef's window looked out onto the area where the bodies were removed from the drop zone of the gallows. 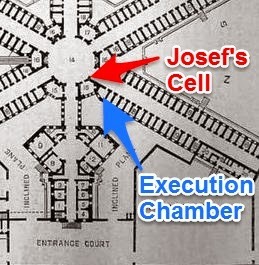 - location of Josef's cell and execution chamber. Was Josef kept otherwise occupied at that critical moment? Perhaps his military guards had taken him for exercise at the far end of the prison complex. While executions might not be advertised in the prison, word would quickly have spread that two men had been executed that morning. It would have been a sobering reminder to Josef of the fate that awaited him, albeit by firing squad. On the morning of his execution, at around 4:45 a.m., Josef would have left his cell and walked down the spiral staircase between D Wing and E wing. Reaching the bottom, he would have turned left and walked through the rotunda to F Wing. It was an eerie experience to stand in the rotunda. To hear the footsteps of the guards, the murmur of voices, and to know that my grandfather had walked in that same place. Wandsworth Prison Rotunda - stairs between D Wing and E Wing. I had hoped that Stewart would give me a tour of the Wandsworth Prison Museum, but everything was in boxes. The new location for the museum (which had been housed in a former garage) was in the process of construction. That was a bit of a disappointment, but some pictures of the Museum can be seen here. Red arrow points to location of prison graveyard. While I was at Wandsworth, I asked Stewart if I could see the prison cemetery. Prisoners who were executed at Wandsworth were buried in unmarked graves within the prison walls. Stewart took me to the location marked with a red arrow on the photograph at right. I had expected to see something. Perhaps a plot of bare ground, or a square of grass. But there was simply pavement or tarmac. The area of the graves had long since been paved over, covered up. There was nothing to indicate that over a hundred executed people were buried there. Walti and Druecke were buried there. Richter was buried there. Stewart told me that at some point, a couple of graves were exhumed (possibly John Amery and William Joyce) and that there remains were transferred to more hallowed ground by the families of the men. Not so for the others. They remain buried beneath the ground with nothing to mark their final resting place.